The Hyperion has long been known to be one of the strongest brawling battleships for small gang and solo in the game; but how did it come to be this way? This reputation began when Tier 3 battleships were introduced in 2006, with the Hyperion’s initial proposed second bonus of 5% increase in capacitor when MWD fitted (similar to the old Thorax/Deimos) being replaced before launch with the 7.5% bonus to Armor Repairer amount we know it for today. When battleships were tiercided/rebalanced in the Odyssey expansion of summer 2013, the initial proposal of changing the slot layout from 8H, 5M, 6L, to 8H, 4M, 7L received very negative feedback, prompting a second proposal. This second take is what gave us the 7H, 5M, 7L (6 turret) layout, coupled with it’s Large Hybrid Turret damage bonus increased from 5% to 10%, and an increase from 100Mb/s drone bandwidth and 100m3 drone bay to 125Mb/s and 175m3, among other small tweaks. Armed with an extra low slot for added tank/damage, a utility high, and a much stronger drone complement, the Hyperion solidified its role as the premier blaster brawling Battleship. Since then, the Hyperion itself has not really been changed that much, but updates to modules and other items have added more and more ‘stealth buffs’ to this already powerful ship, with the more recent ones prompting me to write this article summarizing them for those who aren’t aware. 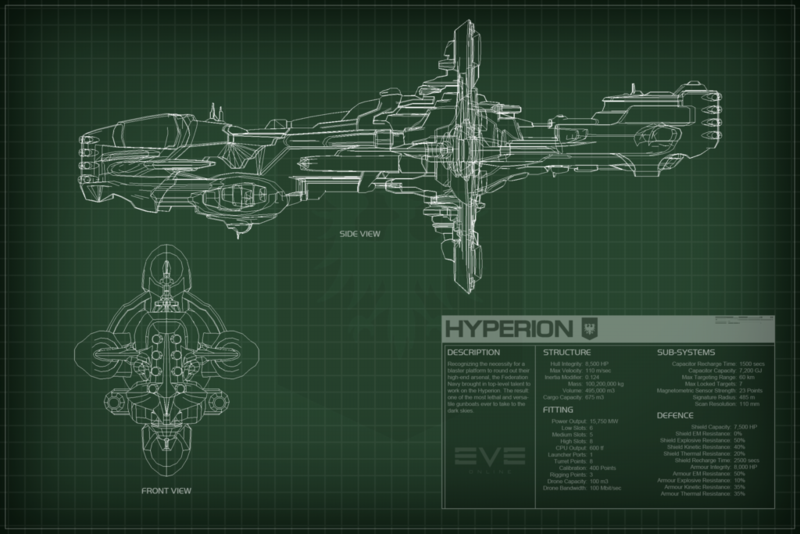 So with that little history lesson over, let me dive into some of the other factors influencing the Hyperion’s power. The oldest among these is the now ubiquitous Ancillary Armor Repairer (AAR), released with the Retribution 1.1 Update in early 2013. For those shield/hull tankers among you who aren’t up to speed on how AARs work, they are essentially a variety of armor repairers that consume loaded nanite paste as fuel for eight cycles (in addition to regular capacitor cost), in order to repair at a greatly increased amount (~2.25x T1, or ~1.69x T2). After the loaded paste is spent they can either repair at a reduced rate (~.75x T1, or ~.56x T2), or go on a 60 second reload (auto-reload is on by default) to refill the paste and continue at the augmented rate. Only one can be fitted to a ship at a time, and they have the same fitting requirements/capacitor costs as a T1 repairer. 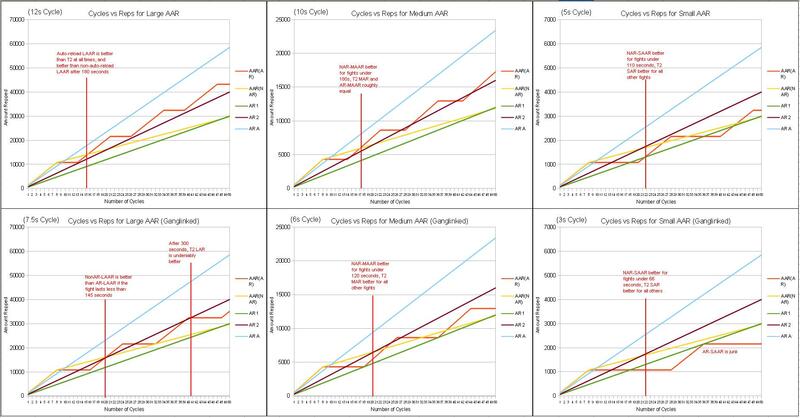 For people who like graphs, here is one showing how they stack up to other reps over time. What the AAR allowed the Hyperion to do better is burst tank by front-loading repairs at the beginning of a fight, when presumably more DPS is on the field, and then let it taper off as enemies are hopefully destroyed. This saw many triple and double T2 rep fits replace one with an AAR, which I will discuss more in my fittings below. Additionally, replacing a T2 rep with an AAR also freed up some powergrid, which is especially useful for those with less than perfect armor rigging skills. The introduction of the Heavy Stasis Grappler line of modules in March of 2016 was another nice buff to the Hyperion as well as many other battleships. If you are unfamiliar, grapplers are essentially BS/Capital only webs that have the strength of the velocity reduction vary as a function of falloff. What that means is that the grappler’s slow becomes stronger the closer the target is, with T2 grapplers boasting up to 85% slows at maximum power. 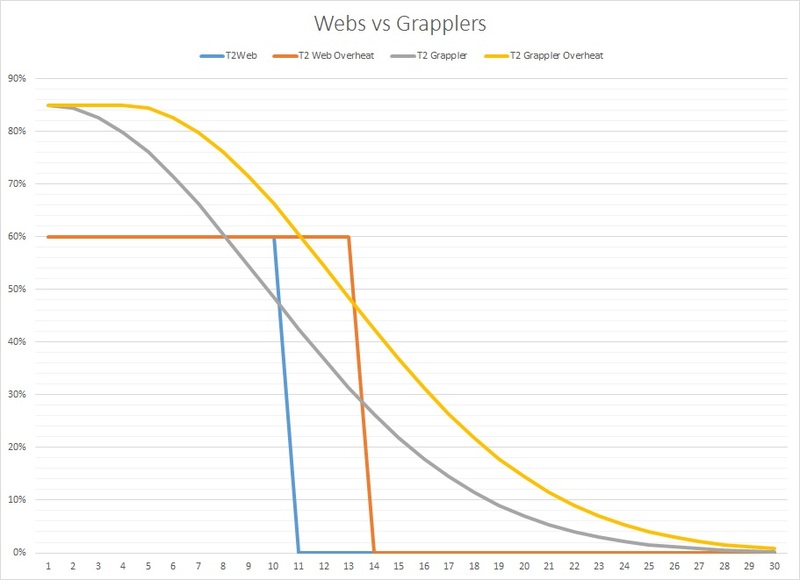 Once again, for those of you who like graphs, here is one showing how grapplers compare to regular webs over range. As with AARs above, only one can be fitted per ship. It’s important to note that the March update which introduced the Grappler also included a change to an annoying quirk where applying webs would cause a target’s orbital plane to re-randomize based on its new slower speed, and during this time would have its angular velocity momentarily drop to 0 as it changed direction. Whereas this quirk was previously an advanced method for pilots to cycle webs and get shots off when the angular dipped, the simultaneous removal of this quirk and the introduction of the grappler really was a worthwhile trade. What the Grappler allowed the Hyperion to do is better slow down and track targets at point-blank blaster range, which was always a much more obvious problem for it than its brother the Megathron, which sports a 7.5% tracking bonus. With the rise of the Frigate Menace (note to the reader: T3Ds are technical frigates, which is the worst kind to be), this lack of options for tracking control at close range against small targets was becoming a very serious problem for brawling battleships. Oftentimes even dual webs were not sufficient to track these ‘AFK orbit at 500m’ locusts’, so the introduction the Grappler was cause for celebration for me and my people (thanks based Fozzie <3). Hyperion pilots can replace dual regular webs with a 1x Grappler 1x regular web combo to have the best of both types, or just run a single Grappler if they are using the other mid for something else. I have found that running the Grappler + regular web combo, when combined with manual transversal reduction through piloting/keep-at-range, a T2 Metastasis, and drop booster on standby, is sufficient for protecting yourself from the menace getting under your guns. 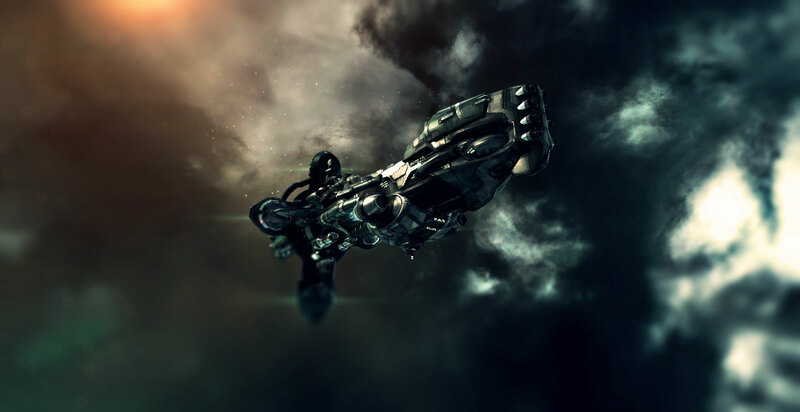 The introduction of Cap Booster 3200’s as part of the Citadel Expansion in late April of 2016, may at first glance have seemed irrelevant to battleships; after all, these are capital-sized capacitor boosters introduced with the capital rebalance. However, once the volume of these charges were available on the Singularity test server, both Big Miker (a fellow battleship enthusiast and amazing solo BS pilot) and I independently figured out that these new charges could fit in Heavy Capacitor Boosters (intended for battleships), albeit only one charge at a time. After poking some devs and verifying that it wasn’t a mistake, but rather an unplanned thing that they were okay with once discovered, we were ecstatic. Cap Booster 3200’s and their Navy editions allow battleships to replace Cap Booster 800’s (previously the largest cap charge in the game) in their Capacitor Boosters with a single 3200, and enjoy highly improved capacitor boosting. The difference is massive; with 1x T2 Heavy Cap Booster using Navy 800’s, a BS can achieve +58.5 Gj/s cold (+71 Gj/s heated), hardly sufficient to power most active tanked fits for very long, forcing many BS to run dual Heavy Cap Boosters with Navy 800’s, resulting in +117 Gj/s (+142 Gj/s heated). This was usually sufficient to run most dual rep armor fits, with some spare to deal with neuts, or manage a triple rep fit. However, with the introduction of 3200’s, a Battleship can now get +145 Gj/s (+ 163 Gj/s heated), from a single Heavy Electrochemical (meta) Capacitor Booster; more than two heated T2 Cap Boosters with 800’s. It is important to note that since the previous advantage that T2 Heavy Cap Boosters held over meta versions in terms of holding 6x 800’s over 5x, makes no difference to Navy 3200’s (1x charge fits either way), there is no need to use T2 heavy cap boosters when using 3200’s (this saves 175 MW of powergrid). Although niche cases for using 800’s as a battleship’s cap charge exist, such as boosting/repping from empty under many neuts, or using them just to cycle guns under neuts on buffer tanked boats, Navy 3200’s are now the primary cap charge that most active-tanked BS pilots should be using. For the Hyperion, this frees up a mid slot where a second cap booster usually would go, as well as the fitting room that used to be sunk into that module. The additional cap/s that the 3200’s provide also makes running your tank, guns, MWD, tackle, and utility high much easier. Although the high volume of the Navy 3200’s (96m3) means the number of charges in your cargo may seem alarmingly low at first, the cap/m3 is exactly the same as Navy 800’s (24m3) at 33.33. On the Hyperion, at most you will have eight charges available, one loaded and a max of seven in the cargo with 3m3 to spare; this will realistically be seven total when you drop one from the cargo for ammo, drugs and nanite paste. On a side note, I have long believed that Battleship cargohold size, among other stats, is well overdue for a rebalance, and is a topic I have brought to the attention of CCP as part of my CSM advocacy. The last major factor I want to talk about is the Asklepian set of implants introduced in the 118.6 update at the end of June 2016. I wrote an article discussing these new implants if you are unfamiliar with them, and will not go into detail about them here. The Hyperion is a prime candidate for using the Asklepians (or ‘Armor Crystals’ as I call them), since its massive bonus to local armor repairs and tendency to fit a massive tank is only further augmented by the set’s own armor repair bonus. A mid-grade Armor Crystal set will net a pilot a ~33.83% bonus to armor repair amount, essentially doubling the Hyperion’s existing 37.5% bonus to the same stat at Gallente Battleship level V. This can be used to either augment an existing fit’s tank, or allow for fewer tank mods to be fitted, while using the Armor Crystal’s bonus to compensate. Now that i’ve gone over some of the important factors influencing the Hyperion’s power, I want to show two of my fittings that I have had success with in my solo roaming. Please note that these are just my own preferred fits based on my playstyle, and are by no means the ‘correct fit’ for everyone. I always suggest that people tweak or adapt any fitting I propose to their own needs and skills (all fits below will be made with all level 5 skills). This fit is a great all-rounder for solo roaming, able to handle a wide variety of targets and situations, while still boasting an impressive tank. The fit puts out just shy of 1400 DPS heated with drones, and can max tank 1632.8 DPS heated for 76.5secs using just Improved Exile booster, after which it drops to 949.1 DPS heated when the LAAR runs without paste, and finally a 763 DPS unpasted cold tank. When combined with a set of mid-grade Armor Crystals, this jumps to 2185.2 DPS heated max tank, which drops to 1270.1 DPS unpasted heated, and 1021.3 DPS unpasted cold. The reactive hardener is quite useful at shifting your resists toward incoming damage, making your tank more efficient against concentrated damage types. A T2 Heavy neut provides a way to catch kiters, make your exit if pointed at range, or simply pressure an enemy’s tank/guns. A T2 MWD allows the ship to reach a decent heated speed of 1517m/s, which can synergize well with the neut and a heated Grappler for catching ships close to your speed. The drones, a set of heavies and two sets of lights, let you unleash max DPS or use light drones to pressure fast tacklers at range. The full fit will run ~383mil (excluding implants), which when insured (Platinum costs ~72mil, will return ~240mil) brings the net loss per hull to 215mil. This fit is much more heavily tanked than the previous dual rep version, adept at solo-defensive tactics such as crashing gate camps and then using the MJD to extract once everything in scram range is dead. The fit does much less damage than the last, at 1050 DPS heated with drones, but can max tank an astounding 3366.9 DPS heated for 65 seconds using just Improved Exile booster, after which it drops to 2339.1 DPS heated when the LAAR runs without paste, and finally a 1880.9 DPS unpasted cold tank. When combined with a set of mid-grade Armor Crystals, this jumps to 4505.9 DPS heated max tank, which drops to 3130.5 DPS unpasted heated, and 2517.3 DPS unpasted cold. The dual heavy cap boosters provide more than enough cap to run this tank for as long as you have charges, as well as provide a great defense against heavy neut pressure. A large smartbomb is great for reducing incoming drone DPS, as well as popping the occasional light missile volley if timed right. The MJD means this fit is meant to be flown defensively, crashing gatecamps and obliterating anything at comes into scram range before extracting. A single Grappler and no tracking rig means this fit is much more vulnerable to small ships under its guns, so carrying improved Drop booster and overheating your grappler while piloting to manage transversal is a must. The drones are the same as the dual rep fit, and can be a valuable defense against small targets. Overboosting and overreping are two large concerns with this fit, since firing both cap boosters can take you from empty cap to ~⅔ full, and the overheated Armor Crystaled reps being more than capable of repping your full armor HP in one cycle. Staggering reps and cap boosters is a key skill to exploiting the full power of the triple rep setup. The full fit will run ~342mil (excluding implants), which when insured (Platinum costs ~72mil, will return ~240mil) brings the net loss per hull to 174mil. A final note: Both fits are pure brawlers, and are vulnerable to being pinned down by gangs with heavy long tackle like HICs, logi, ECM, heavy EWAR, and long range DPS, but both will dismantle most anything else that dares to venture into range of your blasters. Mr Hyde is a 11+ year veteran of the game and is an avid solo-pvper and video maker. He currently serves as a permanent attendee on CSM XI and enjoys discussing PvP & ship balance with the community.